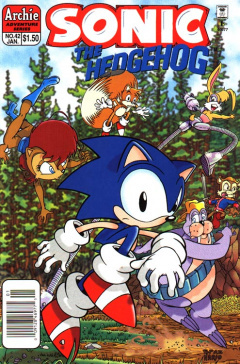 Sonic the Hedgehog 42 is the forty-second issue of the Sonic the Hedgehog comic. This comic features one story: "In Every Kingdom There Must Exist a Little Chaos". It also features a Knuckles mini-story called "Knuckles' Quest". Continued from Sonic Quest 3. Sonic the Hedgehog has returned to the Floating Island, with the Death Egg destroyed. He intends on acquiring one of the island's Chaos Emeralds, but Knuckles refuses to hand one over. Although Sonic tries to convince Knuckles that the fate of Mobius depends on that one Chaos Emerald, Knuckles won't listen, so the two start to fight again. Not wanting to have his island fall into the sea again, Knuckles punches Sonic down, though Sonic mentions that he heard that Knuckles had a spare Chaos Emerald that he stole from the Grotto. He gets up and punches Knuckles down, telling him that the Grotto is part of the royal real estate, and that it belongs to them. Tails arrives, flying over the group, stopping the fight and telling them that fighting won't save the King's life. Knuckles yells up to him, thinking that the King is still imprisoned in the Zone of Silence, until Sonic confirms that they did save him. Tails flies back down to separate the two, while Sonic also tells Knuckles that the King is being slowly crystallized from being in the Zone for too long. He also mentions that he tried his one-billionth ring, but it didn't do anything, and from a comment from Tails, he thought a Chaos Emerald could help him, as well as helping the Freedom Fighters against Robotnik's new creations. Knuckles rubs his head from the battle, wondering why Sonic just doesn't use rings from the Grotto. Tails tries to explain that they got the ones Robotnik stole on the Death Egg, but Sonic interrupts him, telling Knuckles that Robotnik cleaned it out. He also apologizes, which Knuckles accepts, but he still refuses to give up a Chaos Emerald that can help protect his island. Not getting anywhere, Sonic and Tails leave, warning him that he's going to regret not helping Sally's father. The duo return to Knothole Village, with their mission to capture the rings from the Grotto complete. Tails runs up to Sally, hugging her and accidentally telling her that Sonic got into a scuffle with Knuckles again, which he was supposed to keep a secret. As they enter Sally's hut, she scolds Sonic, but he interrupts her by showing the backpack full of rings that he got. Later on, in the Knothole kitchen, Sonic lays back and munches on a pile of chili dogs while Tails tells the story of their adventure to Sally. Uncle Chuck enters the room, having come back from his infiltration mission in Robotropolis to aid the King. He walks over to Sally to give her an update, saying that despite all the ring they captured, they didn't help the King's condition. Although Sonic believes they have failed, Uncle Chuck takes out a royal scroll, noting that they aren't finished yet, as he and Sally want to use a magical talisman to cure the King: the Crown of Acorns. Sonic, however, notes that the King was wearing his crown when he was thrown into the Zone of Silence. Sally believes that, at the time, the King was wearing a phony crown, which Sonic doesn't believe. She takes out the scroll again and shows it to Sonic, pointing out that the holder of the crown must protect it at all costs for future generations. For safe-keeping, the crown is kept in a magical dimension known as Limbo. The problem with this is that nobody knows how to get to this dimension, but Uncle Chuck believes that the magic of power rings can help them find it, noting that power rings grant the bearer knowledge, as well as strength. The group raise their arms, as they prepare to head for the Lake of Rings for "Operation: Save the King", while Uncle Chuck returns to Robotropolis to continue his infiltration. Sonic, Sally and Tails arrive at the outskirts of the Lake of Rings, a few minutes from the next ring appearing, staying a distance away to make sure they don't gather any attention as the location of the lake is a secret. Sally looks at her watch, looking to see the time as Uncle Chuck has notified Fly Fly Freddy, a member of their spy network, to meet up with them. Sonic looks through a bush and notices Sleuth, another member of the spy network, appear, noting that they were almost caught and had to escape. Sleuth notes that he'll tell his report as they head over to the lake, but Sally informs him that it is not standard procedure. Nonetheless, Sonic tells Sally that he can be trusted with the location of the lake. She trusts him, and they walk to the lake while Sleuth gives his report. They arrive at the lake, as Sleuth notifies the group that Robotnik's Combots never transmitted the information about the Lake of Rings. However, in a surprise move, Sleuth kicks Sally aside, mentioning that now Robotnik will have a new supply of power rings, as a whole squadron of SWATbots arrive from behind the bushes around the lake: Sleuth has changed sides. The Freedom Fighters call Sleuth out as a traitor, while they start to fight the huge horde of SWATbots. They appear to have the upper hand, but Sleuth presses a button on his wrist, calling up another bot: a humanoid-fly. It fires laser blasts from its hands, but its mysterious origins aren't a mystery to Sonic, as he recognizes it as a roboticized Fly Fly Freddy. Sonic, angered at losing so many friends, starts throwing a flurry of punches, taking out most of the SWATbots, until he is knocked down by a laser shot from Fly. Sleuth laughs at the three succumbing to the surprise attack, until Bunnie Rabbot appears, pinning Sleuth down to the ground with arm. With Sleuth down, Bunnie focuses her attention on the other SWATbots, reminding the others that she is on power ring duty. While Sally kicks down a SWATbot, she looks over and notices the power ring emerging from the lake. She calls it out to Sonic, but he is stuck in the middle of fighting a whole group. However, with the King's life at stake, he runs toward the ring by jumping on top of the SWATbots' heads, then jumping for the ring. Right as he reaches it, Fly gets Sonic in its crosshairs and fires...but misses as Knuckles jumps in and hits Fly in the back. Sonic grabs the ring and Tails lifts him to safety. Sonic returns to the battle while Knuckles joins in, but with renewed confidence, Sonic introduces his newest move, the whirlwind whammy, using his arms to create two mini tornadoes that destroy the remaining SWATbots, stops Fly, but also disorients everybody else. The battle complete, the Freedom Fighters recover, arresting Sleuth for his traitorous deeds, and taking Fly to deroboticize him. Knuckles, on the other hand, takes his spare Chaos Emerald out of a bag he has with him, noting that he has had a change of heart. Sally takes the emerald, now with a step closer to helping the King, she announces that their operation has entered phase 2. The group return back to Knothole, arriving at the hut holding the King, but before they enter, Sonic is curious as to what made Knuckles change his mind. Uncle Chuck, back again, mentions that it was him who changed Knuckles' mind. He suspected that there was a double agent working among the spy network for some time, so when Fly failed to report for his orders, his suspicious became real. Not knowing who to trust with the information, he contacted Knuckles to inform him for assistance. Knuckles agreed, even going so far to change his mind about the Chaos Emerald issue. Back in the King's room, King Acorn remains motionless on his bed, still mostly crystalized. Everybody approaches his bedside as Rotor connects one of his newest machines to the King, placing the Chaos Emerald on top of it to power it. Once the machine is set up, everybody exits to an observation room. Before he starts the machine, Rotor notifies the group that the machine will release the Chaos Emerald's pure energy, hopefully recovering him. He starts the machine up, but, to their surprise, the effect of the Chaos Emerald accelerates the crystallization of the body. Sally quickly orders Rotor to stop the machine, as they rush in to check. As they arrive, Rotor notices that the acceleration was only temporary, and that the crystallized state has returned to what it was before the machine was started. With the Chaos Emerald idea a failure, Sally orders Sonic to use the power ring to lead them to the Crown of Acorns. He takes the ring out, hoping he can get it to work as he hasn't called on the ring for knowledge for some time. He holds it out, as he accesses the information he needs. The link to knowledge finishes, sending Sonic falling back to the floor and leaving him with a headache. Uncle Chuck, Sally and Tails run over to help him up, wondering if he found the location of the Crown of Acorns or the Hall of Limbo. Sonic, still recovering, has discovered, on the other hand, the location of the King's royal sword, which has a magical link to the crown. The problem now is, he doesn't know the location of the sword. Sally slaps her head, thinking that all hope is lost, but Knuckles walks over to her and comforts her, knowing what it's like to lose a father. He declares that he will make it his own quest to find the sword, intent on seeing the King return to normal. Knuckles begins his quest to find the royal sword, sitting on the make-shift sub seat of the Sea Fox being piloted by Tails. Although Knuckles is cranky about sitting on the make-shift seat, Tails confides with Knuckles, reminding him that to find a magic sword, he must reach out to a magical source. Knuckles notes that he wanted to start his quest to find the Ancient Walkers, but by himself. Tails reminds him that they only appear when something big happens, such as when Knuckles thought he died, when Sonic caught his one-billionth ring, and when he was considered to be the chosen one by Athair. Hence, Knuckles' great-grandfather has a link to the Ancient Walkers, and also him and Knuckles. They arrive at Downunda, the last location Athair was found. They dock the sub and walk for over an hour, arriving at the crater where Tails had found Athair, but they don't see anything. They continue to walk along the desert to find Athair, but end up arriving back at the crater again several hours later, although Tails still believes he's there. Knuckles gets angry at Tails and prepares to punch him, but a familiar voice calls out Knuckles as immature. Tails looks up, recognizing Athair on the edge of the crater. Knuckles walks up to his great-grandfather, asking how he can judge him as he didn't have the courage to protect their homeland. Athair retorts, asking him how he can judge him, as wisdom notes that it is better to be a guardian of a universe instead of a small part of it. Knuckles walks away in shame at his great-grandfather, but Tails doesn't want them to fight. He tries to explain to Athair the reason for their arrival, but he interrupts Tails by calling on a dark storm. Knuckles and Tails find themselves engulfed in this storm, then finding themselves floating through space. Seemingly uncharacteristic, Knuckles starts explaining their journey through space in a very poetic way, stating that they are travelling to the limits of infinity, but that infinity has no limits. They land on a donut-like rock floating in space, as Tails realizes that Knuckles couldn't have said those things. Knuckles confirms that, as they look up to see the heads of the Ancient Walkers floating in front of them in space. Tails tries to explain the circumstances revolving around the King, asking the Ancient Walkers how they can save him with a Chaos Emeralds. The Ancient Walkers explain, metaphorically, about the powers of the Chaos Emeralds, but also mention that the Chaos Emeralds and the King have noting in common. Tails is curious why the emerald won't help them, but Knuckles interrupts, asking the Ancient Walkers for the location of the King's sword. Before he can finish his thought as well, the two are surrounded by a black cloud, sending them floating through space again, making Knuckles angry that Tails wasted the Ancient Walkers' time. The two find themselves floating between three figures, which the Ancient Walkers describe as a sorcerer (a cat), a wizard (a goat) and an alchemist (a bird). They then past three more figures, a charlatan (a fox), an enchantress (a rabbit) and a paladin (a horse), which the Ancient Walkers state that they must face, and with courage and fortitude, they will embrace the sword. The Ancient Walkers end their vision, sending them back to Downunda. It doesn't take long for Knuckles to understand the image he saw: beings of power who know the location of the sword. Tails jumps for joy, now with new-found knowledge of the sword, but Knuckles starts walking away, telling him that he has the new-found knowledge, and that he must now go it alone from here. Although this issue has a release date prior to Sonic Quest 3, the story in this issue takes place after the Sonic Quest series. Sleuth and Fly Fly Freddy return, albeit, turned over to Robotnik's side (Sleuth kept as a dog, while Fly was roboticized). Sleuth is the first character in the Archie Sonic series to willingly turn over to an enemy's side. This page was last edited on 28 March 2019, at 17:36.